Want to learn how to make some traditional Chinese New Year dishes just in time to celebrate? We’ve got two classic foods that you’ve got to try! The Spring Festival, or Chinese New Year, is the most important holiday in China. Today, we’re serving up some traditional dishes to help you celebrate in style! Tomorrow is the start of the Chinese New Year, also known as the Spring Festival, celebration. Food is a big part of the festivities, particularly a New Year’s Eve reunion dinner, where everyone gathers to share in some valuable family time. Most of the traditional food related to the Chinese New Year is tied to good luck and good health in the coming year. Today, we’re going to look at a two of these dishes and how to make them — dumplings and longevity noodles. If you want to make another Spring Festival classic, whole steamed fish, check out this great recipe from Betty Liu. To learn more about the Chinese New Year, check back tomorrow for a new post on ways for seniors to celebrate Chinese New Year! Dumplings are a popular food around the Chinese New Year, at least partly due to a play on words. 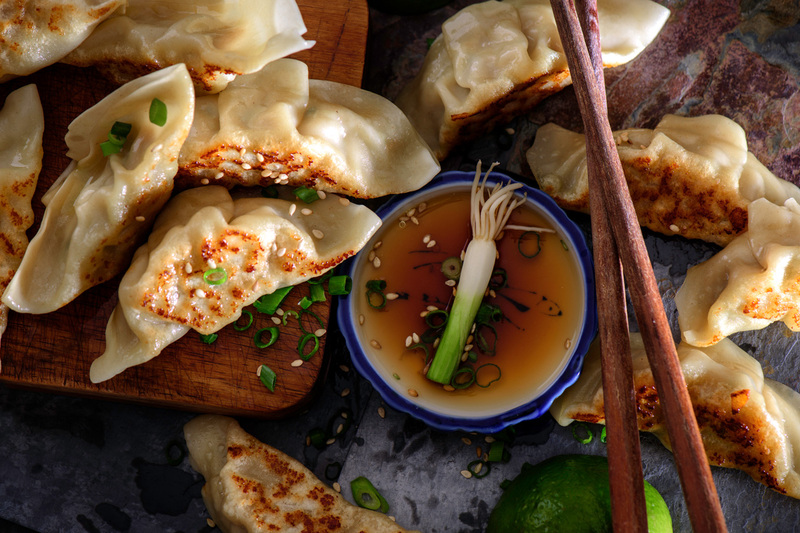 The word for dumpling in Chinese sounds a lot like the Chinese words for “exchange” and “the midnight hours,” which can be associated with the exchange of the old year for the new. Additionally, dumplings symbolize wealth because their shape is close to that of ancient gold or silver ingots, which were formerly used as currency in China. Families will spend time together during the Spring Festival and make dumplings as a team, maintaining the importance of family to this holiday. Also, it’s a popular tradition to hide a coin in one of the dumplings. Whoever gets the dumpling with the coin will likely have good luck in the new year! Combine the ground pork, garlic, ginger, green onions, and egg in a large bowl. Mince the cabbage in a food processor and dry with paper towels. Add the minced cabbage to the pork mixture. Get a large cutting board and lightly cover it with flour. Place a dumpling wrapper on the cutting board and place roughly a tablespoon of pork mixture in the center of it. Lightly wet the edges of the dumpling wrapper with water. Then, fold the wrapper in half and crimp the edges together, folding one side before pressing it closed. There are other ways to fold dumplings if you’re going for style points. Choose how you’ll cook the dumplings — boil or fry. Boiling the dumplings is simple. Bring a pot of water to a boil and add the dumplings. Boil them for eight to nine minutes, stirring occasionally to prevent them from sticking to the bottom. To fry the dumplings, heat two tablespoons of sesame or vegetable oil at medium-high heat in a coverable pan. Add the dumplings in a single layer and fry until the bottoms brown (about two minutes). Lower the heat, add ¼ cup of water to the pan, and cover it with the lid, allowing the dumplings to steam until the water has fully evaporated (about five minutes). Longevity noodles takes a staple of Chinese cuisine, noodles, and ties it to the themes and traditions of the New Year celebrations. With its hopefully long noodles, this dish symbolizes the long life of the eater, which is why you aren’t supposed to cut the noodles! Doing so risks cutting your own life short. Longevity noodles symbolize the long life of the eater, so don’t cut them, or risk shortening your life! There are no set rules that we’ve been able to find for longevity noodles. You can look at five different recipes and end up with as many very distinct dishes. Longevity noodles are usually stir-fried, which is best to do in a wok. If you don’t have a wok, a sauté pan will work as well. This dish can also be vegetarian or use meat. What this means is that you can make tweaks to this dish without ruining a tradition! In a pot, bring water to a boil and cook the lo mein or rice noodles according to the box. Drain and set aside. In a large bowl, combine the cubed chicken, one tablespoon of minced garlic, and one tablespoon of low-sodium soy cause, cornstarch, and ginger. In a separate bowl, combine two tablespoons of minced garlic, three tablespoons of low-sodium soy sauce, one tablespoon of sesame oil, and salt and pepper to taste. Set aside. In a wok or large sauté pan, heat one tablespoon of sesame oil over high heat. Add chicken cubes to the wok or pan and allow them to sit and sear for about one minute. Stir fry chicken until it’s thoroughly cooked through, roughly three to five minutes. Remove the chicken from the pan and set it aside. Add the cabbage and peas to the pan, and cook the mixture until the cabbage is just wilted, stirring regularly. Remove the veggies from the pan, setting them aside with the chicken. Add the final tablespoon of sesame oil to the wok and add in the lo mein and stir for about one minute to lightly heat. Add the garlic, soy sauce, sesame oil mixture and the chicken and veggies mixture to the wok and stir to mix thoroughly. Stir-fry everything for another minute or two so the flavors cook together. Serve and remember — don’t cut the noodles!